Hardly had ‘the ink dried’ on my last posting describing the view from the window of a train arriving at Ozorkow, when I was sent a link to an advertisement looking for an enterprise willing to take over the disused siding to the industrial complex at Ozorkow. How refreshing that the landowner is thinking of restoring the siding to working order, rather than ripping up the rails and covering up the holes with concrete! The last 60 seconds of the journey of the 13:22 ex Kutno to Lodz Kaliska before it stops at Ozorkow station. Video BTWT. Can you spot the overgrown trackbed of the Krosniewice Narrow Gauge Railway? The rails are still there under the grass. The same section of line as shown on Open Street Map. The large chimney seen in the far distance in the video is part of an industrial complex dating back to before WW I. Standard gauge rail access was by a siding which left the main line – at a point clearly seen in the clip – and then crossed the narrow gauge line on the level before turning sharply to the East near the level crossing keeper’s hut. Though disused and overgrown, most of the siding remains in situ. Its route is shown on Google Maps. As number of our regular readers have pointed out the Psykowice Skansen is in the Slaskie province, not the Dolnoslaskie. Behind The Water Tower prides itself on its accuracy. Our stories are obtained directly from first hand sources, or checked against multiple sources, if not. But occasionally we do get things spectacularly wrong. As we did with our Pyskowice story last week. My thanks to everybody who contacted me with the correct information. My sincere apologies to all our readers, particularly to those who put pen to paper and wrote to the Chief Executive of Dolnoslaskie province. See below for the correct address. argues that money would be better spent on roads! EU flag outside the Commission building in Brussels. From a photo by Xavier Häpe on Wikipedia Commons. The European Commission has censured the Polish government’s decision to transfer €1.2 billion from the railway refurbishment program to its road building budget. The decision was the consequence of an investigation carried out by PKP PLK last year at the request of the Ministry of Infrastructure as to how many of its railway investment projects would be finished by 2014. Those projects which could not be completed by the deadline were shelved. This year, the prime minister announced that the unused monies would ber transferred to the road building budget. Now the Commission has reprimanded the government for its decision and said that this money should be spent on railway projects. At a meeting with Commission officials last week Andrzej Massel, the deputy Minister of Infrastructure, responsible for rail and Patrycja Wolinska-Bartkiewicz, the deputy minister responsible for EU projects argued the case for allowing the Polish government to transfer the cash to its road building budget. A final decision is expected to be made shortly. 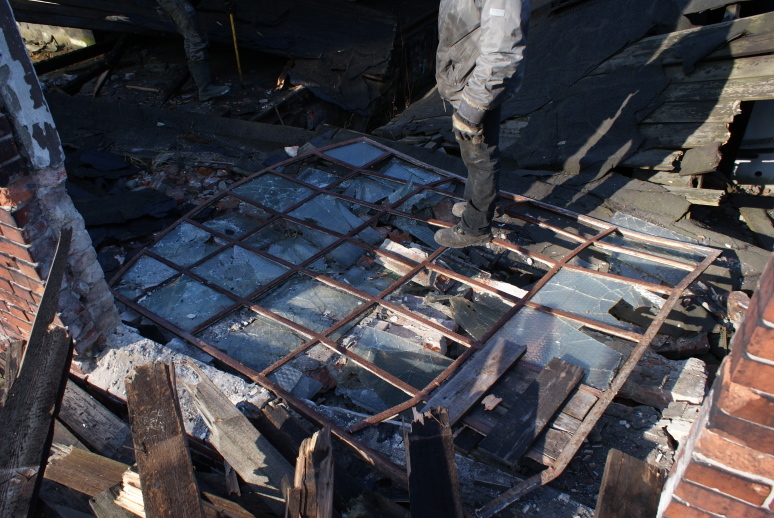 The cast iron window frame smashed by PKP contractors. Photo Arkadiusz Niedzwied. 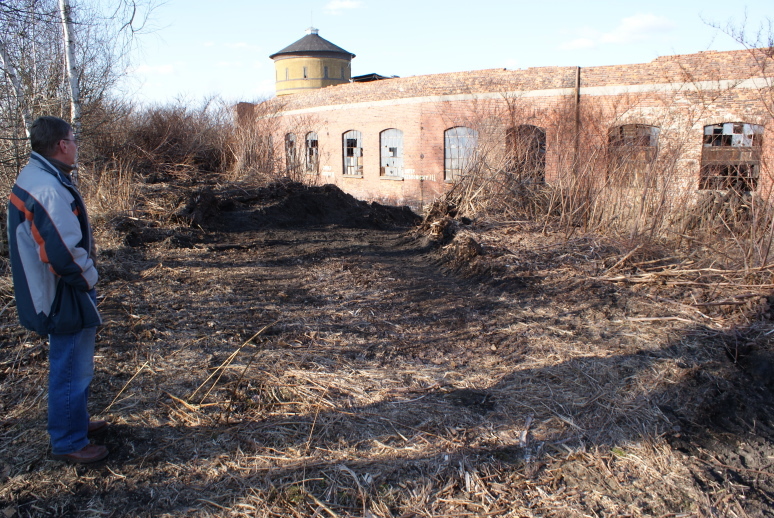 TOZK, the railway preservation society who run the Skansen based at Pykowice and PKP SA have had an uneasy cease fire while the society try to persuade PKP to give them an affordable long-term agreement to use the former locomotive depot and carriage shed. Meanwhile PKP have been trying to get the depot buildings removed from the register of historic monuments so that they can proceed to demolish the remains of the old round house. The bulldozer track leading to the window. Photo Arkadiusz Niedzwied. Now it seems that PKP have upped the anti by hiring a subcontractor to remove the remains of the collapsed roof which lies within the shell of the old roundhouse. Unfortunately the first move of the subcontractor was to rip out a cast iron window frame and part of a wall in order to gain access to the interior of the shed. TOZK members reacted immediately to the damage which occurred last Monday morning by alerting the authorities in Wroclaw and Warsaw about the damage to the fabric of the historic building. The posting schedule on Behind The Water Tower has been abysmal lately. A combination of too much travel, too many projects to juggle, a broken tooth and the progressive general decay of your Editor played havoc with the best intentions in the world. The good news is that I have upgraded my IT which should mean less time looking at ‘washing machines’ spinning while my ancient Mac tries to render photos to our house style format and also give me, for the first time, access to the Internet while travelling. The bad news is that (a) all this new technology will have to be paid for; and (b) there will be a learning curve to climb, and that will eat up more time. I hope to mitigate the effect of (a) by launching an on-line appeal, although that will have to wait until I can find out why PayPal blacklisted me last time I tried something similar. I’m not so sure that (b) can be solved so easily. I seem to be permanently short of time nowadays, which makes me the principal bottleneck in the BTWT production process. Perhaps one of our regular correspondents would like to take on the job of Deputy Editor? For the days when BTWT does not appear, here is some recommended reading. I have not included many excellent publications written in Polish. Reader’s additions to this list (particularly those written in English and dealing with Polish or Central European railways) would be very welcome. Please use the comments facility at the end of this list. – pure nostalgia from the days you could travel to anywhere in Britain by rail and her railways were the best in the world. that don’t work on PKP IC! On the first day of the new timetable change, one might wish to see how late trains are running. 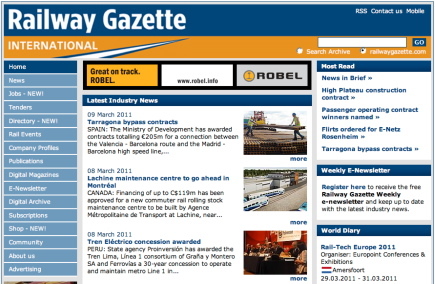 and click on the left side the link to “Biezace informacje o ruchu pociagow” which takes one to the blog of train updates initiated during a previous crisis. 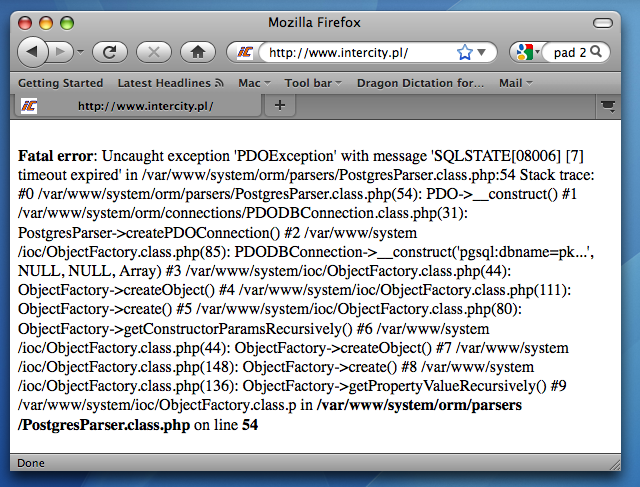 One would then be directed to the hosting service Nazwa.pl, as that domain has apparently expired.